Looking at a Spanish visiting card, you can’t fail to notice that the space taken by the visitor’s name is inordinately long. That’s because Hispanic names are longer than common American or European ones. This can be explained in various ways. First of all, the way surnames pass from parents to children means that people don’t have just one, but two names: their father’s and their mother’s. It’s also possible to add the father’s and mother’s second names, which can lead to having 4 surnames. Then, there are compound names, coming from upper-class families with two lineages who didn’t wish to lose track of their origins. As for the choice of first names, Christian tradition is still very important. It’s normal to find names with a reference to some saint whose historical or geographical origin is also stipulated. So, first names are often compounds. In conclusion, if you add up all the names and surnames which identify one single person, the total can range from a minimum of three to a maximum of… hard to define. Anyway, it’s too long for anyone but the owner and his relatives to remember by heart. If Spaniards are proud of their names, up to the point of not omitting a single one on their visiting cards, it must be said that, for obvious practical reasons, they don’t use them all to address each other. Like Americans and Europeans, they also use diminutives and nicknames, to identify themselves among friends. 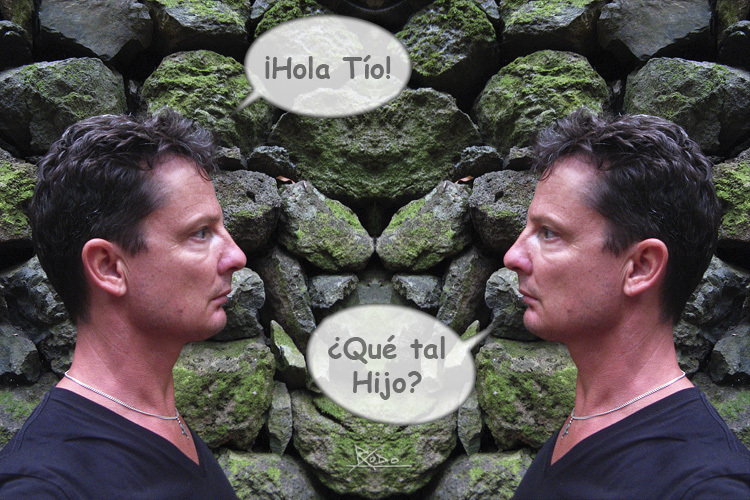 In an ordinary conversation, young people often call each other “tío” (uncle), and girls “tía” (aunt). This term is not to be taken literally, of course. It doesn’t refer to family tie of any kind. It’s merely used with the meaning of buddy, fellow or guy. However, it’s curious to observe that denominations related to family are often used in the informal language: “hijo” (son), “hija” (daughter), “primo” (cousin), “hombre” (man), “mujer” (woman), are frequently used when talking to friends or relatives, to address them or just to punctuate the conversation. This custom is well established and the choice of the word is completely arbitrary. As a result, it’s not uncommon to hear a woman calling her female friend “man”, or hear a brother saying “aunty” to his sister. Once I even heard a girl talking to her mother, calling her “daughter”! For the unwary foreigner, this can be confusing. But, in order to be accepted in Spanish company, don’t hesitate to play this language game, as it clearly shows a typical feature of Spaniards: hardly have they met you than you are already part of the family. And then, should there be any doubt about the family relationship of the people you’re talking to, you can always ask for their four, five or six real names to find out. * The names mentioned in the above examples are purely my invention, and don’t refer to any real people.